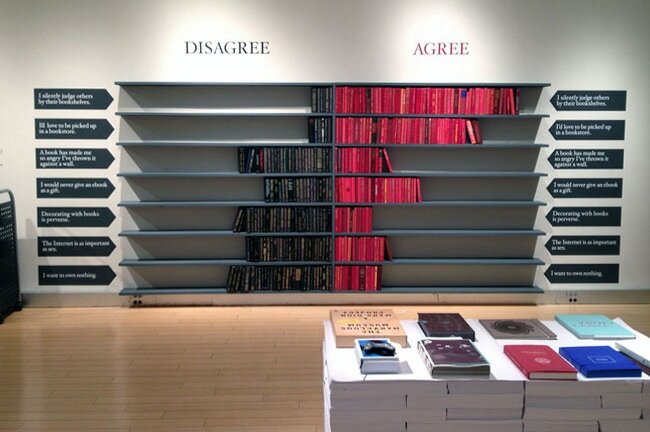 If you've ever wondered whether people secretly judge each other based on the contents of their bookshelves, a recent art exhibit in NYC shows that the answer is yes. "What the Book" is the brain child of Barbara deWilde. It's a hybrid art exhibit which invites viewers to answer a series of questions by shelving black and red books on one of 7 shelves. As you can see from the photo above, the black books are used to show that the visitor disagrees, and the red show agreement. The questions asked ranged from "I silently judge others by their bookshelves" to "I would never give an ebook as a gift", and some of the answers surprised me. For example, a significant majority liked the idea of getting picked up in a bookstore, and they also liked the idea of using books to decorate a room. And of course we all secretly judge people by the contents of their bookshelves. This exhibit encouraged visitors to express what they think about books by using the books themselves as the statement. It was part of a larger exhibit on books, and it included a later section where readers were invited to define what a book meant to them. For those who could not make it to NYC for the exhibit, there is an online option for participating in the poll. There is also a video of the project which you can find over on deWilde's Tumblr blog. It cannot be embedded here. 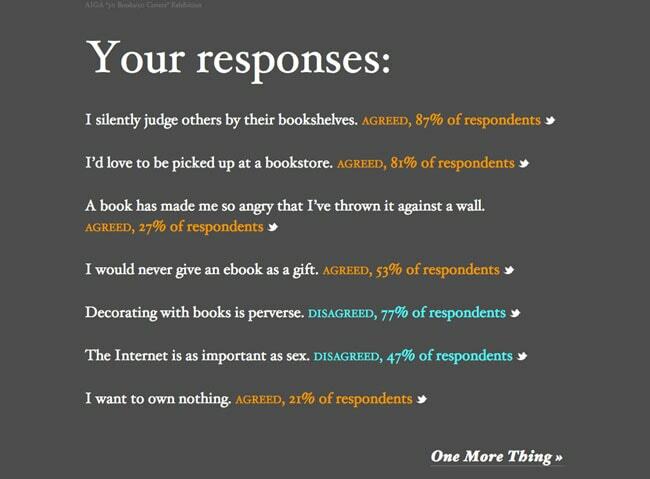 It must have changed since you took the poll — when I did it a couple of minutes ago, it showed that 13% don’t judge others based on their bookshelves.